Wet leisure product powerhouse Certikin has been given a pre-SPATEX promotional boost after its British hot tub retailer network was showered with praise for helping to land a prestigious Caldera Spas top global dealer title. Ahead of the company’s loyalty to SPATEX continuing with a consecutive SPATEX appearance as part of the largest stand presence at the 21st edition of the wet leisure showcase, being hosted from Tuesday, January 31, to Thursday, February 2, in the Ericsson Exhibition Hall of the Ricoh Arena in Coventry, Certikin has been bestowed with the Caldera Spas International Dealer Award for 2016 for its distinguished performance in sales, marketing and customer service. Certikin Commercial Director Ben Studdy praised British dealers of the Caldera Spas range for their efforts and also thanked iconic manufacturer Watkins Wellness for the pedigree production of the hot tubs after receiving the award. 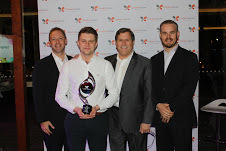 It was presented by Caldera Spa’s Leo Hamacher, Stephen Shugart, and Steven Stigers to Certikin Sales Executive David Steptoe, pictured holding the award, who received it on behalf of Certikin and all its UK-based dealers. These dealers include Caldera Spas Scotland, which has showrooms in Aberdeen, Prestwick and Edinburgh; as well as Prestige Swimming Pools Ltd in Hermitage; and Three Counties Pools & Spas in Hereford, who all currently promote their dealerships to prospective customers in the WhatSpa? Retail Directory. “Certikin is fortunate to be able to supply its customers with such an outstandingly high quality product,” said Ben Studdy. Certikin has booked three dedicated stands for SPATEX for visitors to find out more about the Caldera Spas range and also to check out the latest cutting-edge products that will be rolled out this year, as well as providing the opportunity to meet with members of the team in a spacious hospitality area. Among the product stars of the show will be the revamped eight-seater Cantabria that is the flagship model in the restyled Caldera Spas Utopia range from Watkins Wellness that is going to be centre stage of Stand D10. The Calorex FX System will be officially launched on Certikin’s Calorex Stand C14, while a new VGE Pro UV-C system and Active Oxygen & pH dosing panel will be making their debut on the CertiDos Stand D14. Certikin Commercial Manager Steve Nelson will also be providing an insight into the trailblazing OC-1 filter media during a seminar in Arena 2 on Wednesday, February 1, at 11am. For further details about Certikin’s wide range of wet leisure products or information about becoming a Caldera Spas hot tub retailer visit the Certikin stands at SPATEX from 9:30am to 5pm on Tuesday and Wednesday, and 9:30am to 4pm on Thursday.